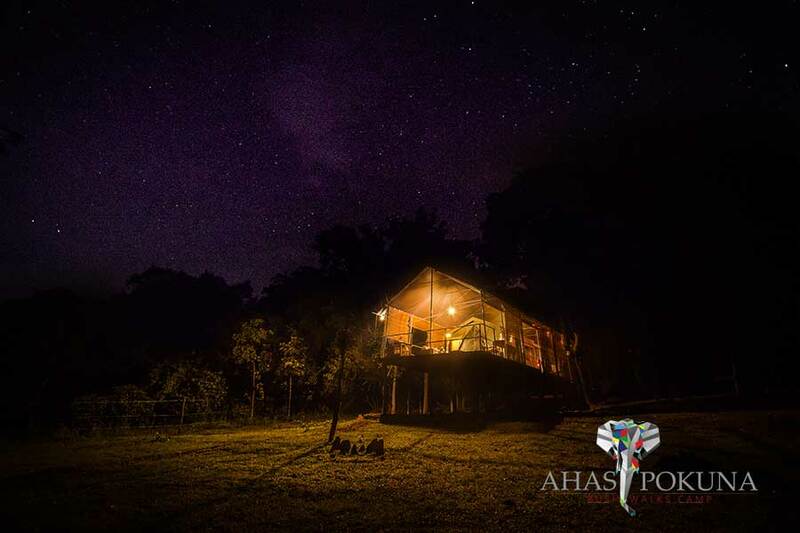 Among the many reasons why Ahaspokuna Bush Walks Camp is so different to any other accommodation in Sri Lanka or even many others in the world, we managed to shortlist the best 7. Ahaspokuna is the only accommodation in Sri Lanka, and most probably in our part of the world, to have a fully-fledged independent star bed for all accommodation units. 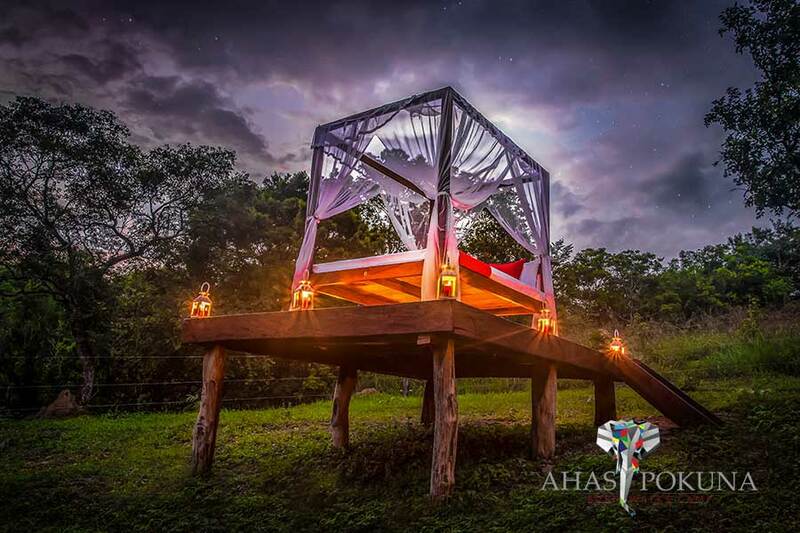 This spacious, very comfortable four-post bed, set on a wooden deck and decorated by a net, would be an excellent option for sunbathing, reading or to have a relaxing and romantic sleep under the stars. 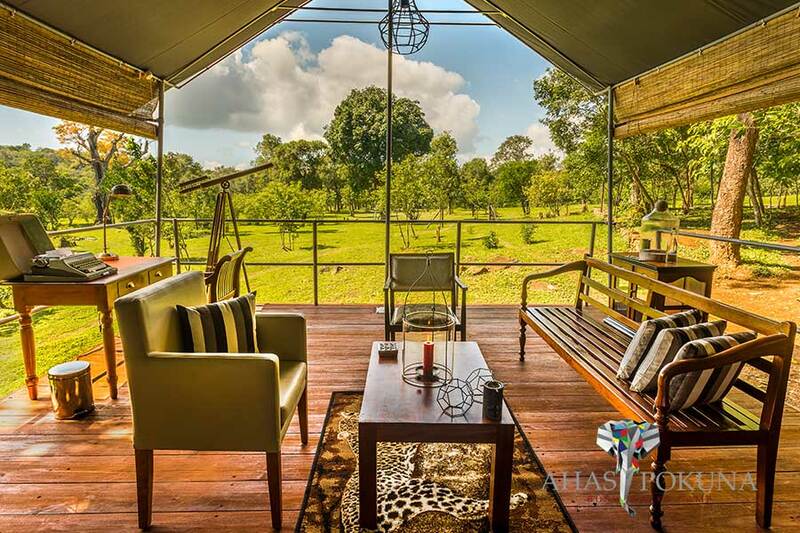 We have created your accommodation units around a grassland and a waterhole which has been the livelihood of man and beast who have lived here for ages. We offer you probably the largest private space of 1000sqm that any camp, lodge, hotel or any other accommodation could offer you in Sri Lanka. There are plenty of spaces within our boundaries for you to read, relax, meditate or do yoga. You have heard of and seen tents, but suite tents? Your accommodation unit (private space) would consist of your arrival deck, sleeping tent, luggage and powder lounge, flushable toilet and an in-door shower that has hot and cold water, romantic star bed/day bed for you to relax or sleep in during the day or night, and the first-ever bush bath tub in Sri Lanka which overlooks the grassland in the 1000 square metres of private space protected by an elephant fence. Guests can enjoy magnificent views of the open grasslands and the mountains from their tents. 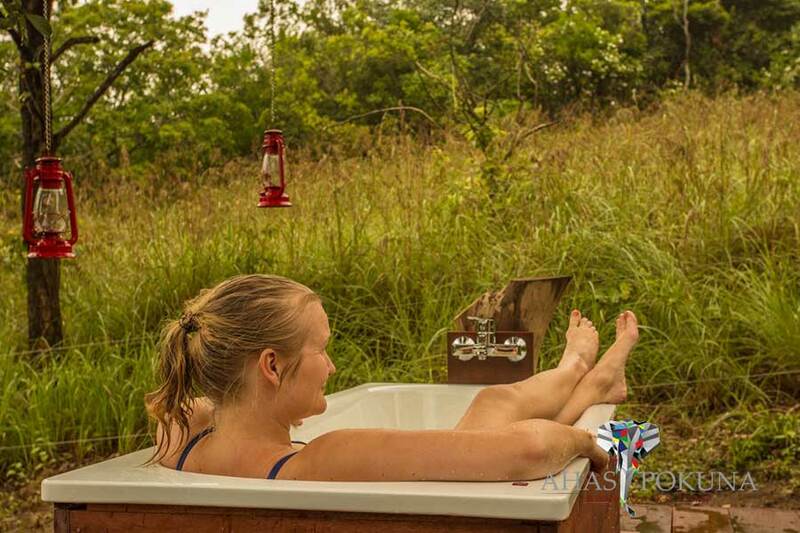 We offer a bath tub, connected to hot and cold water, overlooking the grassland with every accommodation unit. You are invited to use it at any time of the day for a completely refreshing experience. Your bath tub caddy will keep your book and your glass of wine steady. 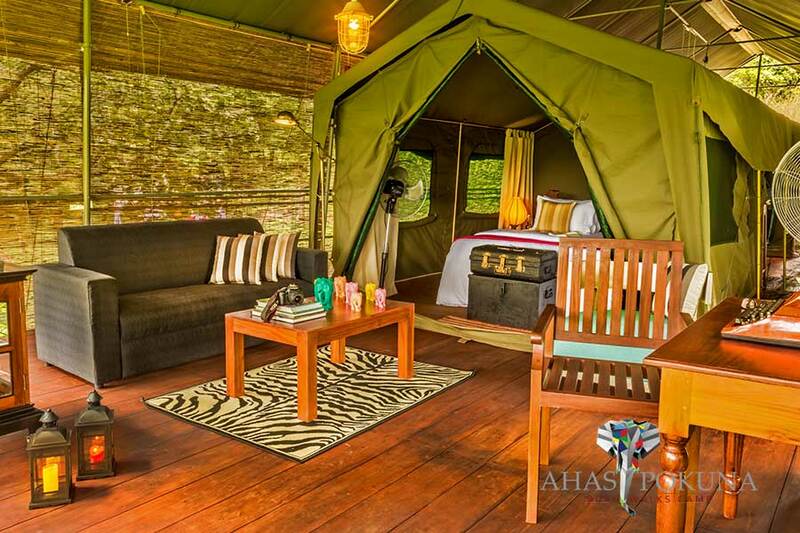 Ahaspokuna is the only all-suite accommodation facility in the country where there is no motorable route, giving peace to the wildlife, environment, and to you as well. The camp is in a remote, undisturbed area, while the last leg of the journey to the camp has to be undertaken on foot, accompanied by the camp staff, providing a different and invigorating way to reach your retreat in the wilderness. Our team will meet you at a designated point and take you to the camp through the welcome trek which is approximately 2 km. You need to come with a lightly-packed day bag and lockable space would be available for your left-luggage. However, if you really need all your belongings at the camp, our staff is readily available to transport them. At our camp, we have not fenced the elephants but have fenced the living area, providing absolute peace of mind for the guests while creating safe passages for elephants to walk in between tents. There is a very healthy and happy herd of elephants living in the Ahaspokuna vicinity and they quite frequently pay visits to see how we are doing. Whether it’s a short, soft trail or a half-day, moderate trail or an adventurous full-day trail, Ahaspokuna has it all. When we are on walks, leopards and sloth bears in the area are shy and wouldn't confront you. Elephants are the ones that our trackers would want to have a watchful eye on. However, with an advance party we would know exactly where they are and wouldn't startle them. 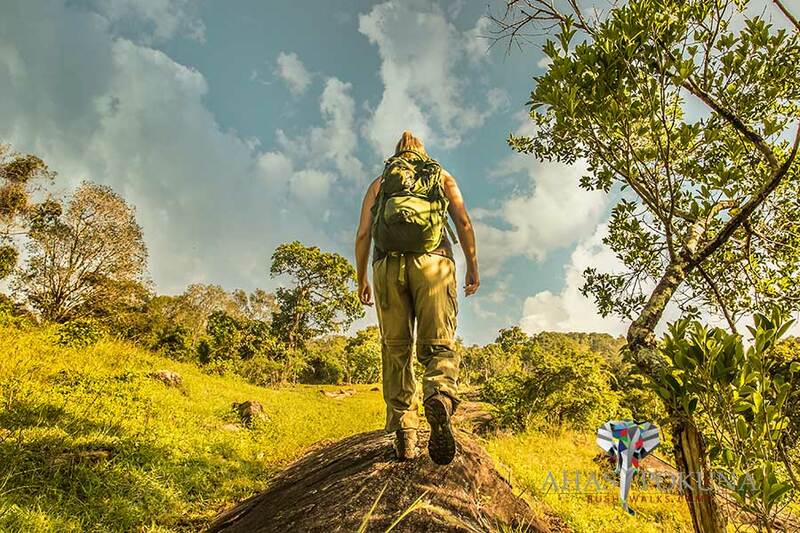 You are in safer hands with our walking safari specialists. Under professional care, walking in the bush is safe. All walks will be guided by a professional naturalist and experienced bushmen who have lived in this area before. 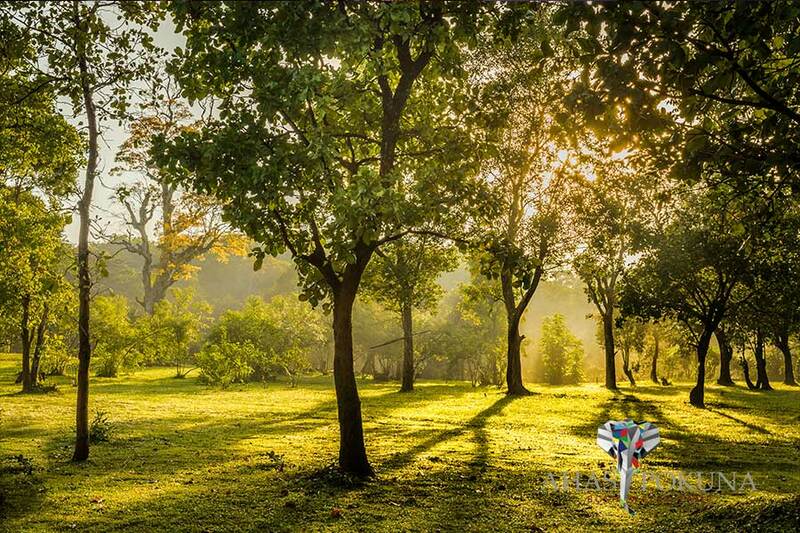 You will only share your magical moments of seeing Sri Lanka’s pristine wilderness with the other lodge guests. You also get fascinating night walks and access to the “hides” to see animals coming to the waterhole. Elephants regularly patronise the waterhole and we have heard the leopard very close to our tents.